Doc Ferds Recio (right) accepts the Fr. Neri Satur award for the GMA-7 show Born to be Wild, which he hosts along with Kiko Rustia. A television program devoted entirely to environment and wildlife conservation is among the recipients of this year’s Fr. Neri Satur Award for Environmental Heroism. Award organizer Secretary Heherson Alvarez, vice chairman of the Climate Change Commission (CCC), chaired by President Gloria Macapagal-Arroyo, said the GMA-7 show Born To Be Wild is feted for "taking environment concerns closer to the masses through real encounters in the wild and gripping presentations of various environmental issues." The show was also commended "for helping in efforts to strengthen environmental awareness among Filipinos, and fostering environmental preservation and care for Mother Earth, especially in the wake of the dangers being faced by humanity due to global warming and climate change." Doc Ferds Recio and Kiko Rustia are the hosts of Born to be Wild. Aside from Born To Be Wild, the 2010 Fr. Neri Satur Award also recognizes the environmental heroism of an 18-year-old construction worker who had saved the lives of 30 people at the height of the devastating tropical storm Ondoy (international name Ketsana) last year. Muelmar Magallanes, who was also named one of TIME Magazine’s Top 10 Heroes of 2009, is being cited for this year’s Fr. Neri Satur Award for his selflessness and bravery. Said to be a strong swimmer, Magallanes, after relocating his own family to higher ground, repeatedly returned to the flooded streets of his neighborhood in Quezon City and helped neighbors trapped by rising waters. Among those he saved were a six-month old baby and his mother. Magallanes will be given the Fr. Neri Satur Award posthumously, as he lost his own life while saving lives during a climate change disaster. Also to be given this year’s Fr. Neri Satur Award is Architect Felino Palafox Jr., champion of environmental planning and advocate of development that does not harm the environment, for Eco-Urban Planning. ; Lutgardo Labad and actor-model Iliac Diaz of My Shelter Foundation for Eco-Cultural Communications through Art and Cultural Leadership; Climate Change Congress of the Philippines (CCCP) led by Cagayan De Oro Archbishop Antonio Ledesma for Leadership in Climate Change Initiatives; and Silliman University (Dr. Ben S. Malayanag III) for Academic Center for Marine and Coastal Conservation. The Philippine Daily Inquirer (PDI) and Miss Earth Philippines of Carousel Productions for ABS-CBN are likewise cited in this year’s Fr. 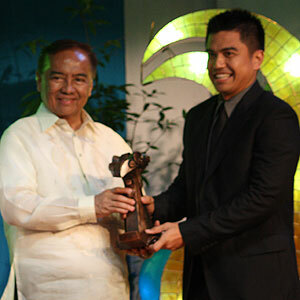 Neri Satur Award for Environmental Heroism, under the category Eco-Friendly Business (Publication) and Eco-Cultural Communications through Broadcast, respectively. The Fr. Neri Satur award, a program of the CCC, the National Commission for Culture and the Arts, UNESCO-ITI, and the EarthSavers Movement, is named in honor of the late priest-environmentalist and deputized forest ranger who lost his life in the hands of illegal loggers in the forests of Bukidnon in 1991.